first night charged if not cancelled at least one week prior to arrival date. first night's accommodation to be paid in advance. Tucked away in the heart of downtown Vancouver - with central access to local cuisine, quick public transit, shopping and entertainment. Minutes walk from Granville, Gastown and the Waterfront. Our renovated heritage building (c. 1911) offers cozy, clean and comfortable accommodation. Amenities we offer: High Speed Wi-fi, on-site laundry facilities, activities & job board, maps and expert knowledge of the local area to name a few! Questions about the local area or the hostel? Our friendly and knowledgeable staff have answers! We're here to make sure your stay in Vancouver is memorable. 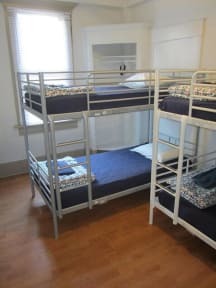 We have a variety of rooms available to suit all needs: Separate Male and Female Dorms, Private Twin Bunk (2x bunk beds – sleeps 2), Private Twin (2x single beds), Private Double (1x double bed), Private Triple (1x double bed 1x single bed) and Private Quad (4x bunk beds – sleeps 4). Thinking of staying a while? Ask what we can do for you. Enjoy the beauty of Vancouver hassle-free! Book with us today! Please ensure you have an international ID (Passport, Drivers Licence) and a credit card with you upon arrival. Traveling Canadians must provide proof of residency. Residents of the Lower Mainland of British Columbia are not accepted. In private rooms, the maximum stay is 21 nights. You must however move rooms every 2 weeks to ensure cleanliness standards. We have a 7 night maximum stay in the dorm. During the high season (May 1st to October 14th), you must book in for a minimum of 2 nights. We have a 2 day (48 hours) cancellation policy. If violated, you will be charged for the first night. My friends and I had a wonderful stay here! We were able to get a 3 person room (so rare!). Very clean room!! Everyone was friendly and respectful of quiet hours. 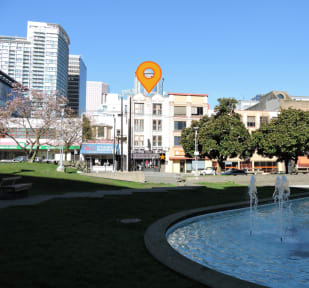 Walking distance to some of the coolest spots in town and everything else can be a short bus/cab ride away. Loved everything about our stay! The only bad(ish) thing I could say is that the showers could be a bit cleaner! Friednly hostel in a great location... I’ve previously stayed in it , so it was a return trip. Hostel was exceptionally clean and staff were super nice and friendly. Unfortunately this place lacked any sort of atmosphere or social aspect. Felt like a boarding house, just really quiet. They had a small lounge but no one was ever in there and it wasn’t very inviting. Unless you meet people in your room I wouldn’t recommend this place as a first stop in Canada or Vancouver. Samesun had more energy and activities. If you want absolute quietness then maybe this place is for you. The location and staff were great. However there is no kitchen and there was an infeststion of fruit flies near where the food was kept. One girl said she had a rat in her room. Other than that, the hostel was very welcoming and warm and they provided tea and coffee which was a nice touch. The laundry room, bathrooms and showers were in great condition and clean. The rooms were nice and had fans, heaters and windows. The hostel is okay if you are planing to stay a lot outside in the city. I won't recommend it if you are planing to make food at the hostel. The cleaning could do better. But it is safe and okay to stay at for e few nights. We stayed here for 6 nights, it is a great central location of downtown. Easily walkable to lots of attractions with great transport links. My only negative feedback would be the lack of cooking facilities which are a microwave and one hob. Secondly the cleanliness of the bathrooms was under par, there was often hair in the shower that was there for days and old toilet paper on the toilet seat. Often the hostel smelt slightly like stale urine. The staff are awesome! I was charged more than the quoted price, and was rebuffed when I queried this. Showers had so much mould and slime that you couldn't really see the tiles. Had the room window open in 2 degree weather just trying to get the sour milk smell out. Laundry facilities were cramped, had to share with the staff washing machine/dryers and could only use the laundry room for a short evening window period.